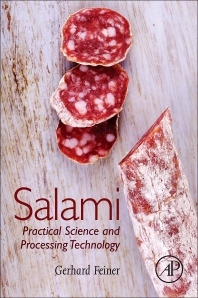 Salami: Practical Science and Processing Technology is a one-of-a-kind reference that covers all types of salami products from around the world, including all aspects of salami, such as microbiology, food safety, and research development trends. It provides the latest scientific findings and developments used to describe the production and manufacturing processes that lead to products that are produced efficiently and safe to eat. The book is a comprehensive resource that combines a scientific and hands-on approach that is useful not only to those in the industry, but also students of meat science. The purpose of the book is to give clear and helpful guidelines to professionals within the meat-processing industry, such as technical, production, operations, process improvement, quality control, and research and development managers. Describes how to avoid faulty products and control food safety, etc. Gerhard Feiner has many years of experience in the industry. He started out with a Butcher apprenticeship and then obtained his Master Butcher degree in Austria. He then went on to be a Production Manager and Factory Manager in Austria, New Zealand and China. Dr. Feiner completed a post-graduate study of meat processing technology and business in Kulmbach, Germany. He became a Technical Manager for an international food additive company based in Melbourne, Australia covering Asia-Pacific and then Technical Director for a large meat processing company in Australia. He has his own consultancy and meat product manufacturing business and is currently the Head of Regional Application and Development Asia-Pacific for an international food ingredient business. In addition, Gerhard Feiner, is an International guest speaker at meat processing conferences and Lecturer at RMIT University in Melbourne on meat product technology.